Best Amber Teething Necklaces are Handmade by Amber Artisans. Handmaid by Amber experts Amber Teething Necklaces for children are attractive to wear and ideal to provide natural pain relief and soothing analgesic support during teething. Comprised of Baltic Amber beads, our Amber Necklaces are very comfortable, lightweight and radiate energies of peace and calm as well as natural pain relief for the wearer. 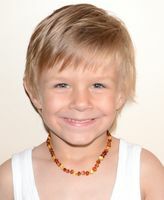 Wearing Amber Necklace will help boost your child's immune system. IMPORTANT: Amber Teething Necklaces are made for wearing not for chewing. Children should be supervised at all times when wearing jewelry, and it should be removed when child is sleeping or unattended! Learn more about Amber Teething Necklaces Safety. How Amber Teething Necklaces Are Made? Every Amber Necklace is lovingly handcrafted by Lithuanian Amber Artisans with generations of experience who carefully polish and softly round the shape of each Baltic Amber bead, so it rests gently against the skin. This ensures maximum skin contact and comfort. The string in each of our Amber Necklaces is knotted by hand in between each and every bead, so should the necklace break (which it should if necessary), the rest of the beads will not scatter. The Teething Necklace fastens with a Screw Clasp that opens and closes easily. At Amber Artisans, we will not use metals or similar materials that can irritate the skin or impede the natural healing process of our Amber Necklaces especially since some children can be allergic to metals. Learn more about Amber Teething Necklace. Sizing Info: As long as the Amber Necklace is not too snug, the length is a personal preference. A convenient way to measure is to drape a tape measure or a piece of string around the neck to see what length you are most comfortable with. Some prefer a shorter length so that the necklace is less likely to get caught on anything and others select longer lengths so that their children can wear one size for a longer period of time. Only you can make this choice! Lear more Amber Teething Necklace Size Chart. Note: Do not tighten screw clasp too tightly, gently tighten it until the two clasp beads touch. The screw clasp parts are plastic and may be damaged if they are tightened too tightly. SO WHAT IS THE MAGIC IN BALTIC AMBER? Amber is not a stone but a natural resin. So as it warms with the body's natural temperature, Amber releases its healing oils (these oils contain succinic acid ) which are easily absorbed into the skin and then into the bloodstream. Baltic Amber has some of the highest concentrations of Succinic Acid found in nature, and this is what makes it so special. Succinic Acid is a natural component of plant and animal tissues, and it's presence in the human body is beneficial in many ways. Amber is also known to reduce inflammation of the throat, ear and stomach and to fight irritation, infections and respiratory disease as it dramatically improves the body's immunity. Natural Amber Beaded Necklaces are a completely non-invasive remedy for side effects associated with teething, such as lack of appetite, upset tummies, ear ache, fevers and colds. Baltic amber is also a natural analgesic that will calm your child and is recognized by allopathic medicine specialists as antispasmodic and anti-fever. Many adults report improvement of arthritis discomfort in their hands when wearing Amber Bracelet on the wrists. Baltic Amber's remarkable medicinal properties include analgesics that reduce or eliminate pain associated with headaches, joint stiffness, dental discomfort such as teething, etc. Succinic Acid is the primary substance in natural Baltic Amber and has remarkable ability to boost the body's immune system, to enhance natural healing, and to protect the body from infection. Under stress or duress, the human body's cells require more oxygen more quickly. A lack of oxygen can result in lethargy as oxygen is vital to the intercellular creation of energy. When the body has low oxygen, it is much more at risk of illness. A healthy body is one that has a slightly alkaline blood ''ph'' balance which means that oxygen is being fully absorbed in all the critical areas with ease. Whenever there is any form of chronic inflammation, disease is a good probability. With chronic cellular inflammation, the body's immune system will automatically increase production of free radicals which can, in excess, cause inflammatory-related disease. Chronic inflammation is quite of the underlying factor in many seemingly unrelated illnesses. Read more about the many healing benefits of Baltic Amber. Baltic Amber Teething Necklace needs to be cared for and treasured like any valuable property. Because Amber is soft and can be brittle because of age, it's most important to be concerned about chemicals and oxidation. Your Amber Necklace should not be stored with other jewelry where it can rub against other pieces, especially metals. We recommend that you place your Amber in a soft pouch (flannel and velvet are ideal for this purpose) with a drawstring for closing. To clean your Amber Teething Necklace, use a soft flannel cloth dampened with clean lukewarm water. You should dry your Amber very carefully, lightly polish with clear olive oil, and then remove any excess oil and restore the polish with another soft cloth. Learn more how to Care for Amber Teething Necklace. Larn how to Buy an Amber Teething Necklace. Wearing natural Amber Jewelry may not cure everything that ails you but it has definitely proven itself as a deterrent to pain and unwanted illnesses. Why not put Baltic Amber to work for you in helping your body feel better and stay healthy? So welcome, and thanks for visiting us. If you have any questions or suggestions, we would love to hear from you so please contact us.